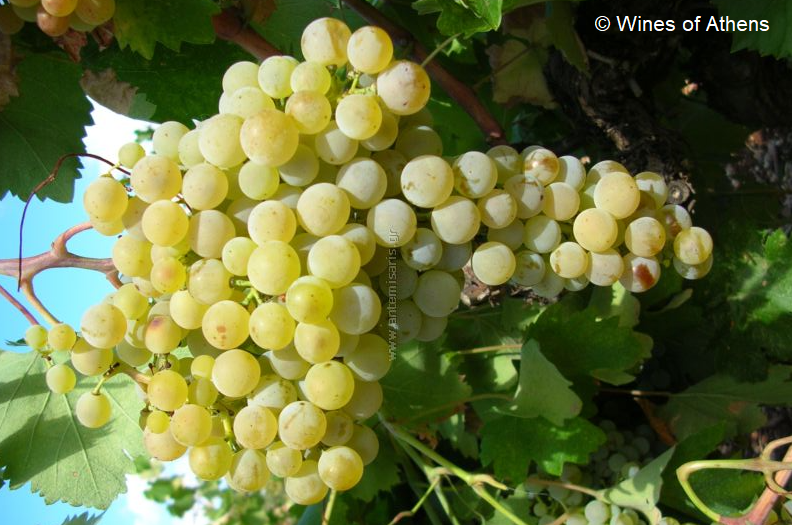 The white grape comes from Greece, Synonyms include Aspro, Dobraina Aspri, Dombraina Aspri, Doubraina Aspri, Doumpraina Lefki, Doumprena Aspri, Kountoura Aspri, Perachoritico, Perahoritiko, Sabbathiano, Sabbatiano, Sakeiko, Savathiano, Savvatiano, Savvatiano Perachoritiko, Stamatiano, Tsoumprena, Tsoumprena Aspre, Tsoumprena Lefki. It may, despite seemingly suggestive synonyms not with the variety Xynisteri be confused. It is also no mutation the red variety Mandilaria (synonym Kountoura Mavri). According to done in 2012 DNA analysis it is a presumably natural cross between Roditis x Karystino, However, this is based on only 20 DNA markers (see under molecular Genetics ). The very late-ripening and productive vine is resistant to both mildews and especially drought which makes it suitable for hot, dry climates. It provides simple, low-acid, neutral mass wines. The variety is in the regions Central Greece With Attica. Macedonia and Peloponnese, the Cyclades and up Kefallonia widespread. Savatiano is the most important variety for the resinated Retsina, Often, it also serves as a blending partner of the more acidic varieties Assyrtiko and Roditis for simple brand wines. With a total of 9,920 hectares in 2010, it is by far the most common grape variety in Greece. Compared to 1990, at that time 20,396 hectares, there has been an extreme reduction by more than half in 20 years. It thus proved in the worldwide varieties ranking the rank 70. This page was last modified at 12 February 2018 at 09:40.